It's difficult to get more quintessentially American than a visit to a Presidential Library and Museum. Visiting the Presidential Libraries/Museums is one of the few bucket list items on my own personal journal of things to do and you can visit two of them during a pleasant long weekend out of Chicago. While it would be easy to fly directly to Kansas City, Missouri, there is a certain poetry to the drive through large swaths of endless rows of farms and green tree filled hills. Missouri is a beautiful state with lots of hills, valleys and non-treadmill inclines. This is in no way a boring drive through the Show Me state. It's lovely from start to finish. The trip begins in Chicago and you drive the smooth stretch of I-55 down through to Springfield with a turn toward Hannibal, Missouri. 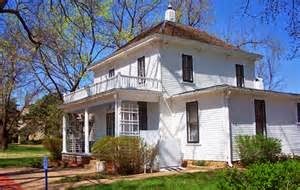 We stopped in Hannibal to visit Mark Twain's boyhood home, but the real destination was toward Kansas City, Missouri and then to Abilene, Kansas. I'm a history buff, specifically a U.S. history buff, but you don't have to be a buff to appreciate the massive historic encounters at these two superbly enthralling venues. You can get to Kansas City in a day's drive and we parked ourselves (well, actually we parked with the valet) at the downtown Marriott in Kansas City. The hotel is this side of gigantic, but the service on all fronts was professionally generous. The rooms are large and clean and everyone we encountered from the valet to the greet staff to the check-in staff to the security guards were all kind and helpful. The food in the lobby bar was even excellent. I still haven't forgotten the outstanding soft pretzel appetizers we ordered while watching a sporting event. 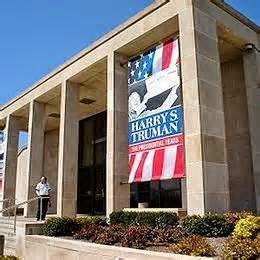 The Harry S. Truman Library and Museum is a short distance from the hotel. The facility is located in the lovely suburban area of Independence. Truman was born in Lamar and he died in Kansas City, but Independence was home for much of his life. 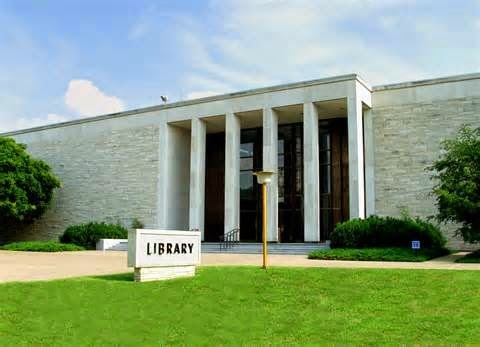 It's a large library featuring the triumphs of one of our most to the point Presidents. He was humble and yet he was a born leader. He certainly didn't appear on the surface to be a man who would lead the nation out of the Second World War and into what is perhaps the most consequential period in American history outside of the flush years directly after the American Revolution. Truman famously said "if you can't take the heat, then get out of the kitchen." Leadership comes in a wide variety of personality types, but every President since Truman has latched on to Trumanisms. Obviously, Truman's life cannot be diminished to a few paragraphs, but clearly he was one of the most remarkable people who enlivened the American century. He, his wife Bess and their only child are buried on the grounds of the Library/Museum. The highlights here are the film, the sections on Postwar America, the Recognition of Israel, Upset of the Century (think Thomas Dewey) and the Courtyard. The even more intriguing part of the twofer Library/Museum visits was to come in Abilene, Kansas. We saddled up for our journey to one of the outposts of the American west. Dwight David Eisenhower who brilliantly forged the campaign known as D-Day has one of the most significant of the Presidential Libraries/Museums. The content at this museum is unusually large and you need a full day to navigate the wide array of historical points. Quite frankly, if you are an avid history buff you could use two days in this Library/Museum. I was mad at myself that we had not allowed enough time at this vast arena of information. The World War II sections were particularly satisfying to this buff. Again, even if you are a casual observer to American history you will appreciate these places for contemplation; and ultimately be grateful for the experience of having this nation to call home. Whether you personally agree with the ideology of a President these places reflect the arc of American history and politics has nothing to do with the libraries/museums. Eisenhower's resting place is solemn and thought-provoking. His childhood home is on the property and there are two buildings housing the mighty and bountiful displays of artifacts, documents and historical archival footage. On a side note, it is a pity Mamie Eisenhower wasn't recognized for her style. Every single outfit on display in Mamie's section (Ike's wife) would and could be worn by me today. I cried during multiple spins around ever changing rooms and the chapel is a graceful resting place for not only Eisenhower, but for anyone wanting a few moments alone to rest in God's grace. To visit Eisenhower's Library Museum you will need 2 1/2 hours out of Kansas City. Then you need the time back. Just allow as much time as possible. On the way back to Kansas City you can have dinner in the gorgeous town of Lawrence, Kansas which houses the University of Kansas. Great town filled with affordable eateries and some nice stretches for stretching your legs on a walk around campus or around town. Practically everything you witness here is a highlight. Glorious day of lounging in the history of two decades of Eisenhower's brilliant and understated leadership. On our return trip to Chicago we ventured a different way home instead of taking the Missouri route back. We climbed north to Clarinda, Iowa. Clarinda is a small town on the Southwestern edge of Iowa. Since Truman and Eisenhower both defined or were definers of the World War II era it seemed more than appropriate to stop in this town to pay our respects to the Glenn Miller Birthplace Museum. The Glenn Miller Orchestra was the most successful of the Depression/World War II era big bands and they even were the first music artist to sell a record reaching one million in sales. Miller joined the Army Air Force band and lost his life in service to his country. The museum is a small place filled with music, photographs, posters, films, documents and original long play albums. It's a wonderful diversion on the road back whether you are in the mood or not. If you are heading eastbound, then you can take in a third Presidential Library and Museum. The Herbert Hoover location is in West Branch, Iowa. The Hoover Library/Museum is small, but it is a delightful location and you learn a tremendous amount on the life of the 31st President. The property is lovely. Don't miss it if you enjoy and appreciate history. We love weekend journeys out of Chicago and particularly when you can take some luxury time in the good weather of spring, summer and fall. Take this jaunt and enjoy the history you breathe in.